THE facts have got in the way of Bill Clinton’s speculative bid for the presidency of Ireland. Dammit. Just when we were having fun with the idea. 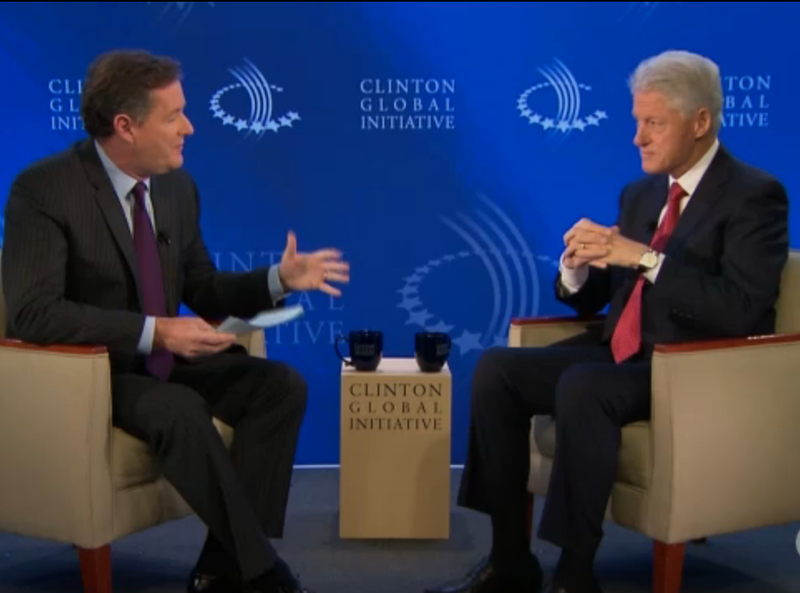 Clinton claimed eligibility for the role in an interview with Piers Morgan on CNN this week. Forgive me for playing fast and loose with the word “interview”, when what I’m really attempting to describe is Piers Morgan climbing into Bill Clinton’s lap for a cuddle. He’s wrong though, as everyone rushed to point out. Clinton’s maternal ancestors, the Cassidys from Fermanagh, are too far back to confer Irish citizenship on him. Similarly, the Louisiana Purchase was too long ago to make him French. So the notion was quickly put down, before everyone had had nearly enough time to sport with it. Half of France and Ireland were busy wondering whether to take it seriously. The rest of us had seized gratefully on the chance to reflect yet again on the Louisiana Purchase, and were sat on our stoops with a bellyful of gumbo, thinkin’ on it. Ireland certainly claims ownership of Bubba. Why wouldn’t we? Haven’t we claimed all six American presidents since Jimmy Carter – or been claimed by them, as a sop to Irish-American voters? Even George W Bush could boast Irish ancestry, although he tended not to, much to everyone’s relief. Midway through Bill Clinton’s second term, Toni Morrison described him in the New Yorker as “our first black president”, saying that he displayed “every trope of blackness”: single parent family, childhood poverty, saxophone playing and so on. We need tinker only slightly with those tropes to make him ours. We’ll have to get rid of the saxophone, naturally; we can substitute an acoustic guitar – not so much played as regularly beaten half to death for the sake of three chords. And let’s replace the single parent with married parents who spend 55 years destructively loathing each other because they don’t approve of divorce. Now throw in Bubba’s alcoholic dad. There, you see? We’ve taken Toni Morrison’s Clinton and turned him into Classic Irish Lad, straight from Central Casting. However, Clinton might prefer the French post to the Irish one. Being the president of France must present at least half a chance of bagging another Carla Bruni. After all, it is a well-known fact that the doors of the Élysée Palace are battered down daily by beautiful heiresses in search of even more upward social mobility. Áras an Uachtaráin, on the other hand… No one is clamouring to get into Áras an Uachtaráin except activists and community workers and the like who – in all fairness to them and we all know they do great work – are probably not going to put out. Nevertheless, the Irish job pays quite a bit better than the French one. Uachtarán na hEireann gets just under €250,000, which is a sight better than the French president’s stingy €180,000. It even compares favourably with the $400,000 (€310,000) that the US president gets, considering the difference in responsibilities. The US president has to Lead The Free World and what have you; the Irish president’s duties consist merely of praising schoolchildren, standing around in the rain at the Ploughing, and articulating pious hopes about the diaspora. But only imagine if Clinton had been eligible – and available – to spare us the soul-destroying boredom of Mary McAleese’s second term. How heartily would we have thanked him. Alas, it was not to be. However, let it not be said that Bill Clinton, having done America twice, is now in the unhappy position of not being eligible to run for president anywhere at all. No, he has hope. He can become a citizen of France, either by living there for five years or by – oh well now, isn’t this lucky? – marrying a French woman. Carla? Carla! You’re wanted. IF I were pope… No, don’t worry, I’m not going where you think I’m going with this. If I were pope, I would not be able to help entertaining the secret hope that someone would present me with a gift of, at the very least, a sleek Alfa Romeo, and ideally maybe a Lamborghini. Vow of poverty be damned. The pope lives in Italy, where the world’s most beautiful and enchanting cars have historically been conceived and manufactured, and yet this week he accepted a gift of a customised white Renault Kangoo, which is arguably one of the boxiest, ugliest vehicles ever to roll off a production line. The photos released to the media show the pontiff looking slightly uncomfortable, sitting in the back of the Kangoo in his little red shoes, the suicide doors open beside him, while Carlos Ghosn, chairman and chief executive of the Renault Group, gazes on with pride. In the pictures, Ghosn looks just about oleaginous enough to be France’s answer to Ireland’s erstwhile Renault king, Bill Cullen, yet the pope was somehow, miraculously, able to resist the temptation to jump into the front seat and drive right over him. Pope Benedict has wanted an electric vehicle for some time, as he is by all accounts very attentive to environmental matters, having installed solar panels in the Vatican and what have you. So perhaps he was grateful for the gift. But even if he wasn’t, what could he have done? Refusing the Kangoo might have precipitated a Diplomatic Incident, so he was no doubt obliged to accept it. It makes you wonder what the pope must do with unwanted presents. It isn’t as if he can pass them on to other popes. And he probably has to be careful not to show favouritism among the cardinals – if one gets a little something, then they’ll all have to. 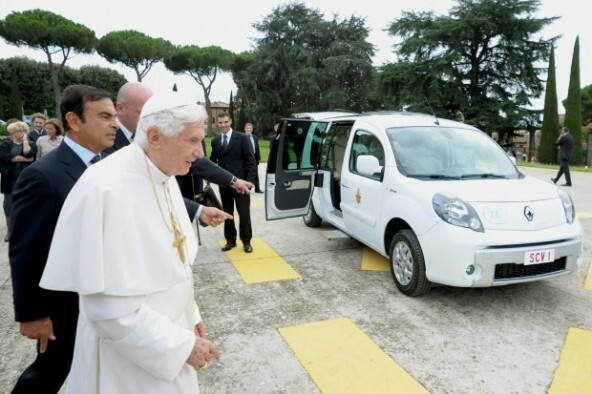 Pope Benedict will use the Kangoo for travelling around Castel Gandolfo, his summer home, and between churches within the grounds of the Vatican itself, but not farther afield. It will do for the urbi but not the orbi, if you will. It won’t replace the popemobile either. The popemobile is a purpose-built, bulletproof Mercedes. The pontiff has another Merc as well – a sinister-looking black one with tinted windows – for getting from A to B. Powerful Germans really only trust other powerful Germans, as we know. And yet then, in one casual remark, Renault’s man in Italy gave the lie to that, and undid all the good the pope was busy doing for the brand’s image, by pointing out that an electric vehicle would never do as a getaway car. Asked whether Renault was working on an electric vehicle for longer papal journeys and trips abroad, Jacques Bousquet was unequivocal. “There’s a problem in terms of power and security, because a completely electric car would not have sufficient acceleration power in the case of a security problem,” he said. ‘Fossil fuels essential to papal safety,’ the headline might have read. There is another reason why this holy alliance might have proved embarrassing for the Vatican too. It’s not just because so many of Renault’s vehicles have names that sound like euphemisms for the kind of body parts that would be unmentionable in the vicinity of St Peter’s. It’s because one of Renault’s ads for its Twingo (see what I mean?) featured a couple of gay men getting hitched in a church, with the tagline ‘Times change, the Twingo too’. But to each his own, I suppose, when it comes to morality. The pope is all in favour of electric vehicles, whereas for some of us, electric vehicles are an abomination. In automotive terms, the only true marriage is the marriage that takes place between a quantity of fuel and a quantity of air inside a combustion chamber; anything else is against nature. READERS may be familiar with the meme known as First World Problems, or White Whine: “I tried to spread cold butter on my toast – the bread ripped”; “one pillow is too low – two pillows is too high”; “can’t apply for a college grant – my parents earn too much”; “ordered schoolbooks – they haven’t arrived yet”. OK, that last is not one of them, but it will be after this week, and the sight of all those “frustrated” parents clamouring outside the gates of Schoolbooks.ie in Walkinstown, Dublin, demanding delivery of the books they had ordered weeks ago. How laudable, observers might have been thinking to themselves. Look how deeply those parents care about their children’s education – giving up their free time, fighting on-air battles, fearlessly navigating Dublin 12, agreeing to be photographed without makeup and so forth. Then your thoughts might have turned to those parties most closely affected by the non-arrival of the schoolbooks – the children. We are encouraged to believe this experience is upsetting for the children. Ha ha. Slapping my thigh. Fine Gael TD Mary Mitchell O’Connor is particularly keenly attuned to their tender little feelings. “Some students may feel nervous or embarrassed about not having all of their books, and it’s important for all school staff to be aware of this,” she is reported to have said. She urged teachers to be patient and sensitive, which seems rather hopeless. Some teachers are innately patient and sensitive and some – famously – aren’t. It was ever thus, and there doesn’t seem all that much that can be done about it at this stage. But consider for a moment the spectre of hordes of schoolchildren turning up in their classrooms without any books – and not just without any books, but with a proper excuse for not having any books. It’s not that you’ve left them at home, or on the bus, or – and this is every bit as likely – that you haven’t actually got around to acquiring them yet. You haven’t got any books, which means you can’t do any schoolwork, and it’s someone else’s fault. For a child, that’s your little cup of happiness filled to the brim right there. Which of us doesn’t distinctly remember wishing for an outbreak of swine flu, or a heavy snowfall, or a burst pipe, so that the school would have to close? Even as you read this, there are hundreds and hundreds of children of school-going age, all over the country, hoping that someone famous will die tomorrow so they can get the day off. The little darlings are actively wishing death on people. Face it. Ideally, what you want is a big death, on the scale of an Eamon De Valera, in the hope that you might get two days out of it. One pupil I recall tried to fool the teacher into believing someone important had breathed his last. “Miss, Miss, did you hear? 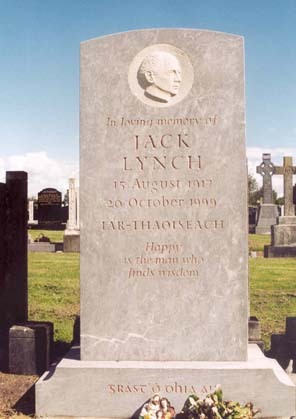 The Taoiseach died.” The teacher said: “Mr Lynch the Real Taoiseach is alive and well. Now go back to your seat and cop on to yourself.” Teachers were like that in those days – full of ripe, visible politics. It isn’t as if we’re known to be a nation of swots, either. Mind you, President Michael D Higgins has this week demonstrated that he can become fluent in another language in only three weeks. This seems a little suspicious. You can’t help wondering if he might have been able to speak Spanish already – all those years championing Latin America! – and pretended he wasn’t, just to get the praise, and be teacher’s pet. Incidentally, President Higgins, if you were just looking for a Spanish translation of the word you used to describe Michael Graham and his fellow Tea Party types in 2010, I think you’ll find it’s ‘pajero’. Any red-faced Mitsubishi driver would have been able to tell you that. No, if going back to school were a pleasant experience, then why would you continue to have recurring nightmares about it for years afterwards, in which you turn up in the classroom with not a clue what’s going on and not a stitch on under your gabardine? (Some of us like to combine our anxiety dreams into a single narrative.) Why would you remember the scent of new stationery as the sole pleasure associated with September – a pleasure that wore off as quickly as an agreeable smell? This little hiccup in the delivery of schoolbooks will do wonders to ease the children through the sorrow of this time of year, when their freedom is taken away once again and they’re ushered back into the awfulness of routine. Remember, the object is to prepare them for a whole lifetime of predictability and constraint. Let’s let them enjoy the interruption.